Social networking becomes more and more popular today. It hit the Internet in the last few years and is gaining its popularity among different types of users. Ignoring negativity around your brand and users’ comments may become a nightmare for your business. On the other hand, properly handled complaints and quickly resolved customers’ issues will add credibility to your company and improve your customers’ trust and loyalty. As new trends rise, popularity of various social media platforms shifts. According to Digital Insights Statistics for 2013 74% of marketers believe Facebook is important for their lead generation strategy, 4.2 billion people use mobile device to access social media sites and more than 23% of marketers are investing in blogging and social media. For 2014 the number of marketers who invest in social media will grow as well as the tendency to offer customer assistance through various social media channels. Social media is a surefire way to quickly reach people. So, while creating a buzz around your brand do not forget to offer your prospects traditional communication channels to reach your sales team. Your Company profile in social media networks should include your phone numbers, emails and preferably a link to your live chat so that your prospects could easily get in touch with your sales team and discuss all private questions. When we compare email support to support via social media channels we should talk about quality vs quantity. On social media you address to the whole auditory of your consumers while via email you offer assistance taking into account individual demands of your users. According to McKinsey survey e-mail remains a significantly more effective way to acquire customers than social media – nearly 40 times that of Facebook and Twitter combined. And the reason is simple 91% of all US consumers still use email daily, approximately the same percent is applied to the consumers around the globe. That’s the question we should think first before starting to air our laundry publicly. Transparency is good, but preserving users’ privacy when it goes about some specific tech support questions or individual issues is more important. Today it’s very popular to discuss technical issues on forums and offer assistance with them. However, it is necessary to keep the balance between resolving issues publicly and switching to other channels for private support. It is important to monitor forums and assist your customers, but when doing this, do not communicate from your personal profile, create your company profile, include your company logo, contact information and a link to your live chat to let your users contact your support team directly with their concerns. 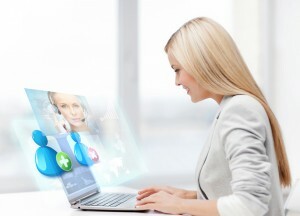 Having click-to-chat button became a must-have for all ecommerce businesses and service providers today. Online live chat button shows that customer support team is online and is ready to handle queries right away. Integrating social media with your live chat window will make the experience more pleasant and will add a feeling that your company cares about support quality. You can add Facebook and other social media plugins to your pre-chat or leave a message forms and even to the Post Chat Survey letting your customers share their experience on social media. This will add transparency and ensure your customers that they are the highest priority for your company. Offering proactive customer service via social media channels is one of the strategies which can be adopted by your customer care department. It requires monitoring social media channels and reacting to all posts and comments. On the other hand, it can be also used for sharing various useful for your customers information. You can recommend different articles via G+, share on Pinterest your graphical materials or upload your white papers and presentations to Slideshare. We at Provide Support use all social media networks to be with our customers and offer assistance when they require it. Share with us how you combine social media and traditional customer support channels. This entry was posted in Articles, Tips and Tricks and tagged customer support in social media, live chat and social media, social media in customer service. Bookmark the permalink. Good to know the results that you shared on base of your knowledge and experience. Social media plays an important role to boost up your customer services abilities in all other channels as well. The information provided by you is helpful for customer services businesses and understanding with social media results. This is a very insightful and informative article that leaves me thinking that with more and more new marketing tools and the vast reach of some of these tools developing an integrated marketing strategy that support you business goals is even more important than ever.